Peaches are incredible this time of year in New England. We get our peaches from a local farm. (Cider Hill Farm in Amesbury MA.) I knew that I needed to make a summer dessert with these. 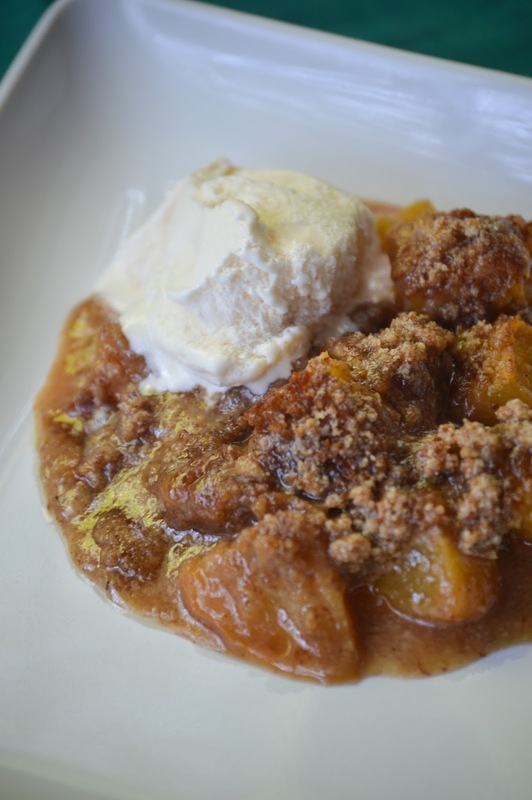 I LOVE apple crisp in the fall, so I thought peach crisp would be very fitting given that it's transitioning to fall. We went away "camping" this past week(there's a cabin with an oven) This dessert was so simple to make. If you have an extra 30 minutes on your hands and want to make something absolutely delicious, make this. Do yourself a huge favor and you can thank me later! 1. Preheat oven to 375 and prepare an 8x8 inch pan by coating with butter. 2. In a large bowl, toss peaches, lemon, and 1/2 the coconut sugar. 3. In another bowl, mix the almond flour, cinnamon, nutmeg, salt and remaining coconut sugar. 4. Add the softened butter to almond flour mixture and work with hands until crumbly. 5. Add peaches to the pan, then top with the almond mixture. 6. Bake for 10-15 minutes until dessert starts to bubble. 7. Serve with coconut ice cream or my banana ice cream!